As we age, many activities that have brought us joy are lost as physical limitations set in. Gardening does not have to be one of those lost hobbies. With a little planning, gardening can be made accessible for everyone. 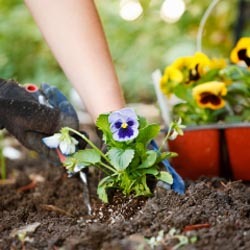 No matter what your needs or abilities, there are ways to modify your practices, situations and tools so that you can enjoy the therapeutic benefits of gardening. High temperatures can lead to fatigue, heat stroke and other dangerous conditions, so garden early in the morning or late in the day when temperatures are lower. Drink plenty of water to stay hydrated. Wear lightweight, loose fitting clothes that cover exposed skin. Wear a hat, apply sunscreen, eat light meals and wear gloves. 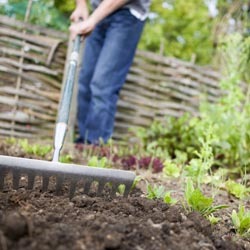 Getting down to the dirt can be difficult if you have joint or mobility problems. Use raised bed systems to reduce the need to bend or kneel. Knee pads are also a good idea, or you can use a lawn chair cushion to make kneeling more comfortable. Garden stools can provide an intermediate step between standard gardening and raised beds. Adaptive tools like Radius tools offer better leverage and improved grips help make gardening easier. Look for ergonomic tool designs that can alleviate hand pain and help you leverage your motions more easily for more efficient gardening using less effort or strain. If a large garden is outside your ability or endurance, there are still areas you can indulge your green thumb. Choose container gardening or window box projects for smaller areas that are easier to reach but can be just as productive and fun for creative gardening. Don’t overlook the possibility of vertical gardening. Climbing plants reduce the need for bending and stooping and bring the plants into easy reach. Look for fences, walls and other areas you can use for vertical gardening, or create unique vertical container gardens to make the best use of climbing space. If you have trouble managing a garden on your own, sow seeds of gardening joy with others in your life and you’ll have plenty of able helpers. Invite neighbors, friends, children and grandchildren to help out in the garden, or offer to help start a joint garden at a senior center, community center, church or elementary school where many hands can make light work of garden chores. Even if gardening gets more difficult as you age, you don’t have to give up your passion for playing in the dirt. Adjusting your gardening style is easy and you will continue to enjoy the beauty, bounty and relaxation that gardening brings.